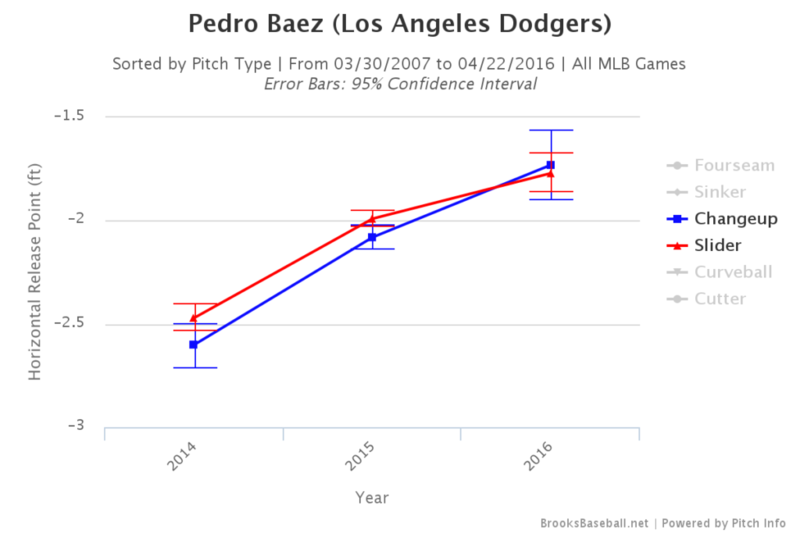 Are Pedro Baez’s off-speed pitches actually ‘significantly improved’? The Dodgers bullpen improving from 2015 relies on the emergence of one if not two relievers taking the next step forward in their development. Aside from Chris Hatcher, Pedro Baez is the pitcher the Dodgers seem most confident will amount to something due to his plus-plus arm strength and two developing off-speed pitches. While Baez has always had the potential to be a back-end bullpen arm based off his raw stuff, his command has let him down at inopportune moments and his off-speed pitches never seem to have progressed. Early in 2016, however, one scout appears to believe that Baez is making progress. One scout who has seen Baez multiple times this year said he has shown a significantly improved slider and changeup. The scout said he considered both pitches to be below-average as recently as last season. That sounds like an amazing potential development for the direction of the bullpen the rest of the season. The question is whether it’s actually true or not, so I decided to see if there were any early season indications that Baez was actually better. For starters, let’s look at the horizontal and vertical movement (respectively) of the slider and the changeup in 2014, 2015, and 2016. The changeup is actually looking significantly worse in terms of movement, with less tailing and sinking action to it. The slider on the other hand is similar across the the plate, but has added significantly more tilt to it, giving it more depth. So there does appear to be something improved in regards to Baez’s slider, which could potentially give him one more quality off-speed pitch than he’s had in previous years. Granted, it’s been less than a month in 2016, so the sample size is small. I looked at video of Baez and couldn’t find a whole lot of visual changes, so I thought maybe the release point had been altered slightly. Sure enough, there have been minor but notable changes. The change you see on the chart is essentially Baez’s release point becoming slightly more over the top than before. This shift in release point corresponds well with the changes in movement we’ve seen from his off-speed pitches, as we would expect the change to have less fade and the slider to have more vertical bite to it, which is exactly what has happened so far. So at least the slider (if not the change) is showing improvement, but apart from that, even Baez’s pitch usage appears to have changed. When Baez has been hurt, it’s generally been due to poor fastball command combined with becoming predictable because he only has the confidence to throw the heater in key counts. Working with a more equal distribution of pitches should help everything play up, and the more confidence he develops in his slider or change over the course of the season, the more likely he is to use those pitches in key moments. 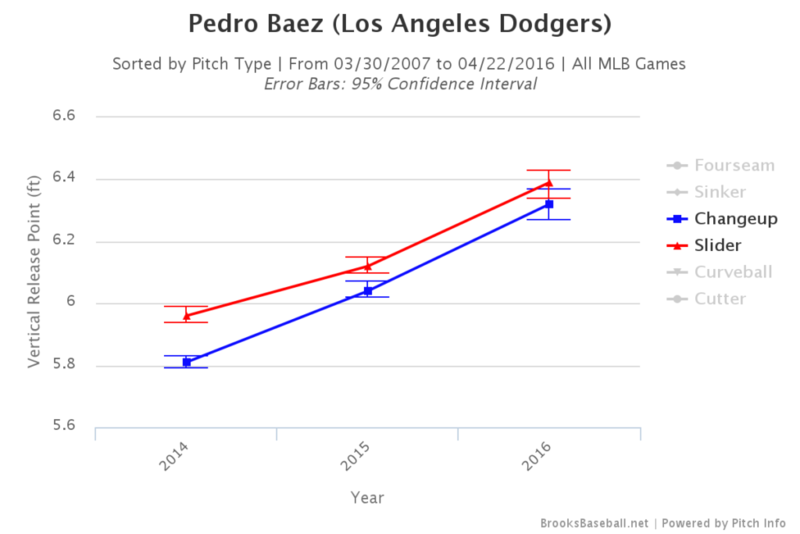 Pedro Baez may not be a completely changed pitcher, but there is evidence to support the claim that at least his slider is “significantly improved”, and even if the change isn’t actually better, just the confidence to use it has the benefit of putting another pitch in the mind of the batter. We’ve been down this road before with Baez allegedly improving and taking steps forward as a reliever, so take it with a dose of skepticism (god knows I am), but it’s definitely something to watch as we move forward in 2016.